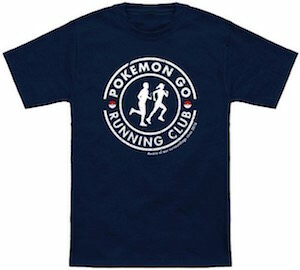 Pokemon Go is really popular and now there is a t-shirt that you should wear while playing this game. On the t-shirt you can find two runners and yes they brought their smartphones as they are playing Pokemon Go of course. Around the runnings you can find the text “Pokemon Go Running Club”. Simply wearing this t-shirt does explain to people why your are running around and maybe just standing in front of their house. You can get this Pokemon Go t-shirt in men and women’s styles and in sizes Small – 6XL. 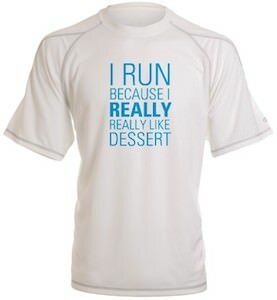 And all these running shirts come in many colors and are made from 100% cotton. This women’s tank top shows Princess Ariel going for a run. And luckily for her she is not a mermaid any more because then doing her running would be difficult. 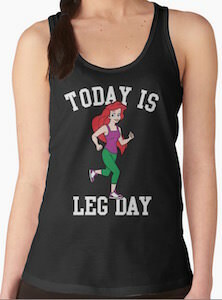 Besides a running Ariel the shirt also says “Today Is A Leg Dag” and that makes this racer back tank top perfect for when you do you leg exercises or for when you go for a run. This women’s tank top is made from 100% cotton and comes in sizes XSmall – L and if you want a t-shirt then that would be an option to. Don’t let Ariel out run you so start doing your leg exercises today. 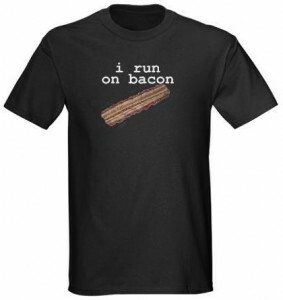 On the front of this shirt you simply see white text that says a funny saying of “I don’t run. And if you ever see me running, you should run too beacause something is probably chasing me.”. Made from 100% cotton to give you such a soft and comfy t-shirt that will also be very durable to last a long time. Available in a wide variety of women’s fitted sizes that will range from Small to 2XL and choose from 17 different shirt colors like hot pink, eggplant purple and more. Also have a look at all of the other shirt styles like a hoodie, tank top, unisex fitted t-shirt a more. Are you a girl that runs? If you are then you are gone like this t-shirt. This t-shirt that comes in all kind of fun colors shows the text “I Run Like A Girl Try To Keep Up” and yes it even has a stick figure running tips that seems to leave behind some flames. Now the other runners can just try to catch up because you seem to be the fastest runner of the pack. 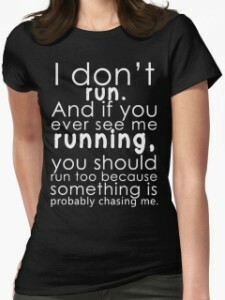 This running t-shirt comes in women’s sizes Small – 2XL but they run a bit small so choose one size up. 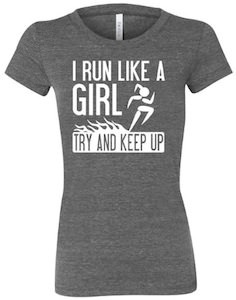 Come check out all the fun colors of this I Run Like A Girl Try To Keep Up T-Shirt. Are you a Zombie loving runner? OK you have to stop running because Zombies hate fast food. This black t-shirt shows a bunch of Zombies trying to chase a runner and below that there is the text “Zombies hate fast food”. This 100% cotton zombie t-shirt comes in sizes Small – 3XL and it’s unisex design. A Zombie t-shirt like this is great for any time of the year but it’s specially great to wear to a race or for halloween. And maybe a night on the couch while watching a Zombie movie or TV series. 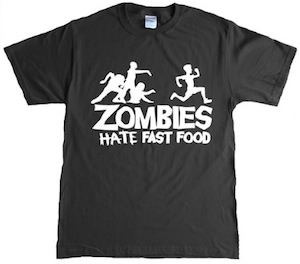 Tell the runners to stop going to fast by wearing this Zombies Hate Fast Food T-Shirt. Do you need a t-shirt that makes a statement, one that tells everybody you are crazy, wacky and somewhat of a rebel, Don’t let anyone tell you that you can’t run with scissors in your hand again. 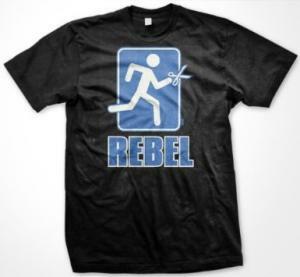 Here it is a t-shirt that features a person running with a large pair of scissors in their hand, also underneath you will find the text “REBEL”. A very durable t-shirt that is also really comfortable and is available in many colors, also this t-shirt has a wide variety of sizes from Small all the way up to 6XLarge and check out the different styles of shirts. 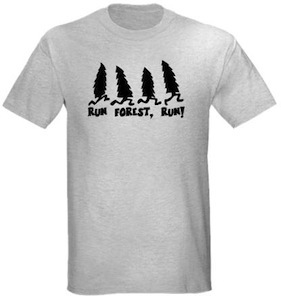 If you dare go check out the Rebel Runing With Scissors T-Shirt. Are you a triathlon nut and looking for the perfect working out shirt? 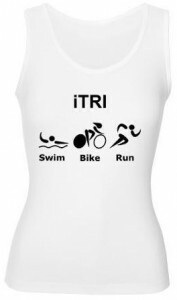 Don’t look any further, this is an awsome tank top to comemorate your love for the triathlon. Features the three icons and their meaning underneath them, Swim, Bike and Run. aswell as at the top chest area you will find the cool saying “iTRI”, that is a neat way to put it. You can get this100% cotton iTRI tank top in sizes Small to 3XL and dont forget to look at all the other men’s and women’s styles of t-shirts and tank tops you can get this iTRI logo printed on.